Mike’s Country Meats has earned a reputation as the #1 Beef Jerky in Wisconsin. From our years of working in meat processing and production, we have a tried and true recipe for absolutely the BEST Beef Jerky you will find anywhere. In fact, satisfaction is guaranteed! Due to the requests of our loyal customers, we are now offering our world class Beef Jerky for sale on line! 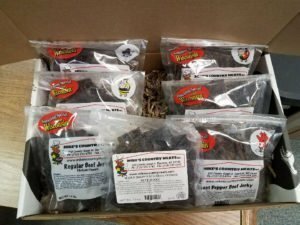 Have Wisconsin’s #1 beef jerky delivered right to your door! Mike’s Country Meat’s is now one of the proud sponsors of Larry Smith Outdoors! Make sure to tune into his great show on Sunday mornings at 7:30am CST! For Larry Smith Outdoors – CLICK HERE! New Gift Boxes - Now Available! Our business started 1984 as Mike’s Wild Game Processing out of our home in Campbellsport, Wisconsin. Mike’s deer processing reputation spread and business expanded, so in the spring of 1998 a separate meat processing building was constructed. During those years we continued to add new equipment to serve our customers needs. By 1999 our customers need and desire to have us add sausage making as an additional service required our state licensing and a 500 lb. smokehouse was added. 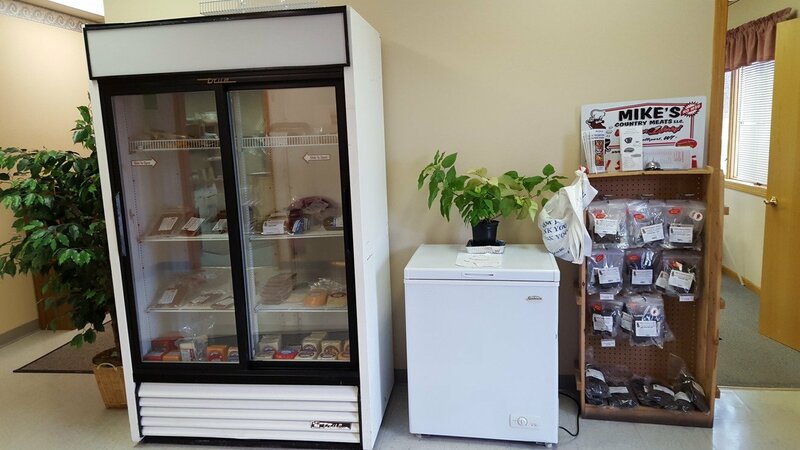 In 2002 we opened a store in Kewaskum offering fresh cuts of meat and sausage selling wholesale. It was then we changed our name to Mike’s Country Meats, and during this time, our beef jerky recipe was created. It took many months to perfect our great tasting beef jerky recipe; little did we know that it would take off as it did! In no time at all the customer demand required a 500 lb. tumbler and a 1000 lb. smokehouse just to keep up with the jerky accounts. So in the spring of 2006 we decided to sell the store and concentrate on what we do best; our famous beef jerky and flavored beef sticks. We added a horizontal slicer and another set of carts for our big smokehouse. We are a family owned business, our Son Randy and our daughter Christina have been a big part of our business. Randy works in direct sales servicing his weekly accounts at local service stations, pubs, taverns, and convenience stores in the Southeastern Wisconsin area. He also makes the sausage. Christina oversees the cutting, packaging and quality of our #1 beef jerky. Shawn, takes care of our distributors as well as maintaining our equipment with a few other various duties. Kassi, Randy’s girlfriend, takes care of our website and social media and also helps find new accounts for the weekly route. Mike and Lora (Dad and Mom) have provided the stepping stones for the future. We wear many hats in our business: Mike is in public relations and is responsible for acquiring many of the stops on the weekly route. Lora holds down the fort, doing all of the book work and keeping up with the changes in the company overseeing the many varied duties needed to expand the business. Since our tasty beef jerky has become so popular, we’ve had nationwide customers ask about ordering. These are folks who came across our Jerky at pubs or convenience stores while visiting our fine state of Wisconsin on vacations or family trips. Now our web site gives us the opportunity to expand and offer our Famous Jerky to customers throughout the United States. Because YOU asked for it… we are “Meating Our Customer’s Needs”! Remember our Number One Beef Jerky makes a perfect gift – a taste of Wisconsin home – to send to your college students, family & friends… what a treat to their taste buds! I am a major beef jerky consumer and have had all types of beef jerky from all across the country. There is no doubt that Mike’s Jamaican Jerk Jerky is the best I have ever had….Period. Please continue doing what you guy’s do best, and thank you! Hot Jamaican Beef Jerky is the greatest jerky in the world in my opinion. The flavor is a perfect blend of sweet, smokey, and hot; the texture and moisture content is perfect. My dad was a butcher and sausage maker when I was growing up so I am picky about meat in general, even more so about jerky. Mike’s has my vote all the way! As you well know, we have been going through a lot of exciting new changes here at Mike’s Country Meats. We are now able to sell out of the state! Make sure to check stores near you often, because we are on our way! The most exciting news is that we are now officially a part of the Larry Smith Outdoors team! How awesome is that?